Let's start with a definition. Generally speaking, a skid is a platform on runners or other vertical supports such as a skid foundation. The terms "skid" and "pallet" are often used interchangeably for load platforms used in material handling and logistics applications. In terms of professional usage, however, the term "skid" refers to a unit load base which is different than a pallet. Let's take a closer look at those differences, the history of skids, as well as the advantages they offer in modern material handling applications. A pallet is a load platform that includes a bottom deck or face while a skid has a top deck but no bottom deck. There are some inconsistencies in usage, however. For example, a nestable skid is often referred to as a nestable pallet. Skids are also referred to as single deck pallets. Before the emergence of the double-faced pallet in the 1930s, skids or sleds were used in industry for storing and moving materials. These devices typically featured a wood deck and vertical legs fabricated from steel or iron, or wooden stringers. The use of skids for material handling may date back several hundred years, to a time when they were used to skid or sled material over dry land. Skids or platforms of the early 20th Century typically did not have vertical support in the center, as they interacted with lift trucks that employed a single lift platform rather than with two forks. The image above displays an early lift truck with such a single lift platform. The development of pallet forks and pallets with a center stringer provided a significant advantage. With the addition of the center stringer, the reduction of the span between supports meant that thinner deck boards could still provide adequate stiffness. The addition of the bottom pallet deck in the 1930s also meant that unit loads of materials could be more readily stacked in order to improve space utilization in factories and depots. In the Second World War, skids or sleds were used tactically in the Pacific theater of war for pulling supplies over contested beaches during battle, with a rope attached to a vehicle. Double-faced pallets were more commonly used for distribution during WW2. Examples of modern skids include wood pallets without a bottom deck or nestable pallets. 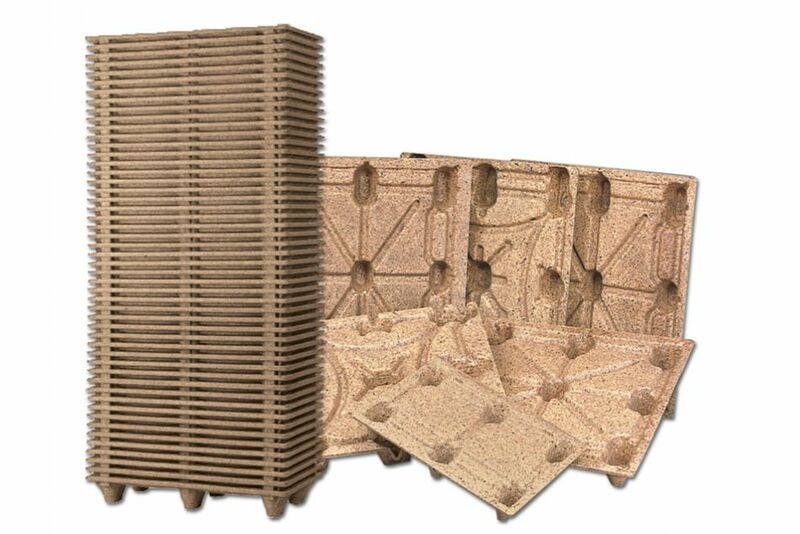 Such nestable skids include Litco's engineered wood pallets, as well as plastic distribution pallets. Examples of both types of skids are pictured earlier in this article. Many paper pallets would also be classified as skids, such as the IKEA paper pallet pictured above. An important advantage of nestable pallets is that of improved cube efficiency. Nested pallets take up less space than empty and stacked. In terms of reduced transportation cost, the transportation of nestable pallets is typically much more cost effective than for double-faced pallets. In storage, both for shipper and receiver, the nestable pallets require significantly less storage space. The limitations of nestable pallets typically include incompatibility with conveyors and racking, although there are exceptions to these generalizations. Some nestable pallets now have enough bottom coverage to be conveyable, and some nestable pallets have bottom decks that can be affixed after shipment, thus combining the benefits of nestability with the performance advantage of having a bottom deck. Such innovations are not yet widely used. Nestable pallets can be successfully racked when used in combination with wire mesh decking. It is important to train material handling personnel so that they understand the limitations of specific types of pallets when it comes to pallet safety. Attempting to place a non-rackable pallet in storage racks without support decking, for example, could have dangerous repercussions. It is sound practice to instruct employees to not rack loads if they are not familiar with the performance rating of the pallet they are handling.